Looking for something to do with the kids on a miserable wet day? What about designing a T Shirt. If you reach out and grab an Artline T Shirt Marker you could while away a couple of hours. They have 2mm polyester fibre bullet tips that are tightly covered with a handy air tight cap that can be posted on the end of the barrel when in use. As you would expect the pigment ink is waterproof & can be washed at 60 degrees C (as long as the ink has been fixed) it’s also fade proof. Tape a design to a piece of card – make sure it is dark enough to see through the fabric. Position the card in the T Shirt. Fold the sleeves & sides around the card & secure with tape. Turn over making sure there are no wrinkles. Trace around the outline of your design. Fill in the design, taking care to fill in all white spaces. When you are happy with your art work remove the card. Once dry fix the colour by gently ironing, taking care not to get the ink on your iron or other parts of the T Shirt. Or being used here to create a design on a canvas bag. 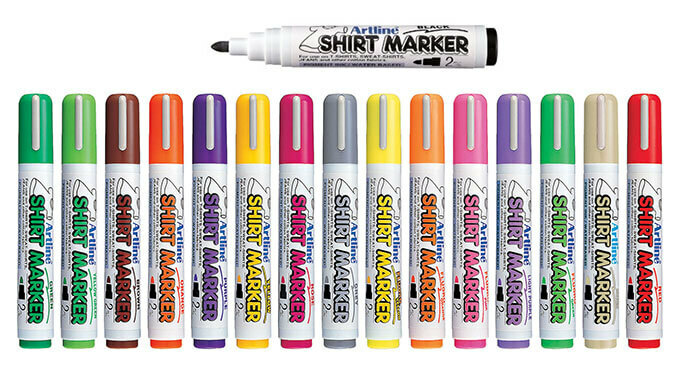 Of course you don’t just have to stick to T Shirts, these markers can also be used to personalise, a variety of cotton fabrics like jeans or sweat shirts. Alternatively it seems some creatively minded souls use these markers for a touch of decoupaging, which put simply is the art of decorating by pasting cut outs to objects, covering with paint or ink (markers) & often finished with varnish. I’ve seen some impressive examples from to tables to a chest of drawers, even a pair of shoes! These Artline markers are available in a wide range of single colours as well as dual tips. You can choose to buy individually, in packs of 4 or 12. 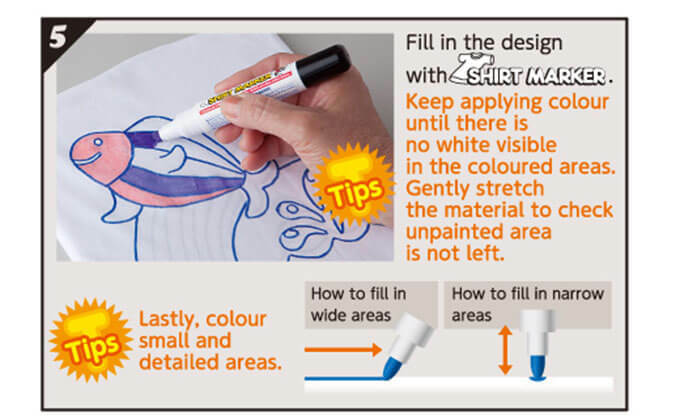 From the Artline Website they give the following tips on how to use their T Shirt Markers.